Back to school is extremely busy for us so as part of a sponsored post for Collective Bias I created an easy family meal using Kraft Recipe Makers. As a teacher I’m busy all throughout the day and coming home has only gotten busier with the arrival of Avery. Plus Riley is now taking dance lessons, which is super cute, but makes us extra busy. That’s where Kraft Recipe Makers comes in and makes my Chili Verde Chicken over Ranchero Pasta a quick and simple weeknight meal. This meal is my go-to meal for nights where Riley has dance class because I marinate the chicken in the tomatillo finishing sauce while we are at class. I always find that the easiest way to marinate things is in a gallon size Ziploc bag in the refrigerator. 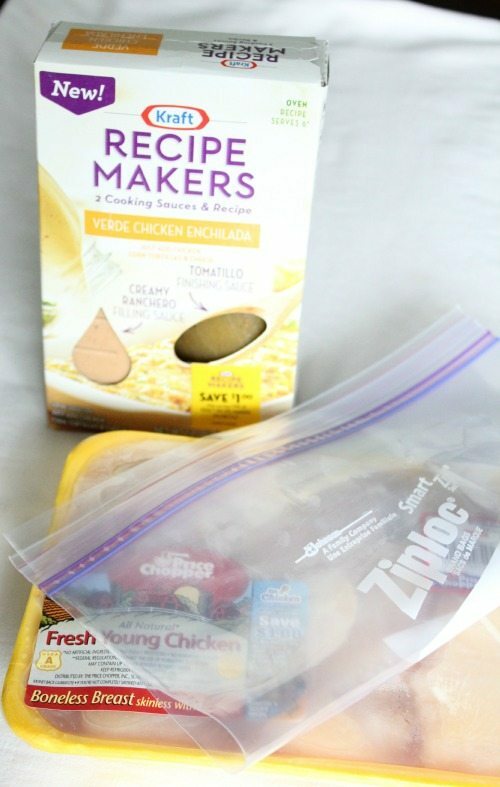 It makes clean up a cinch because you just need to remove the chicken from the bag and then toss the bag. I like to slice the chicken into strips before I place it in the marinade so it can really soak it all up. When we arrive home from class I start the pasta and chop the onions and red peppers. I quickly saute the onions and peppers, while Joe grills the chicken strips. 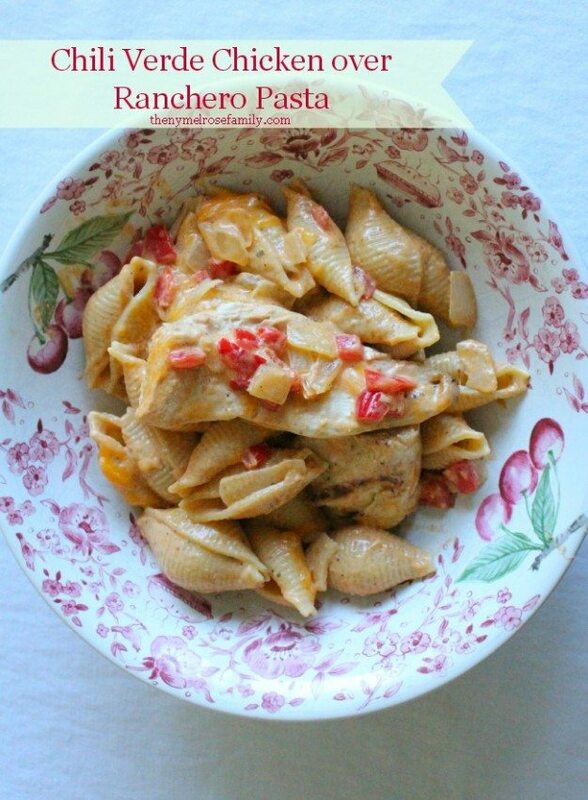 Once the chicken is grilled and the pasta is cooked, I add both to the pan with the sauteed onions and peppers. The final step is to add the Ranchero Sauce over the top. We added a 1/4 cup of water to the pan to make the sauce a little thinner. With two quick turns of the pan a gorgeous family meal is done! A weeknight, family meal made simple with Kraft Recipe Makers Verde Chicken Enchilada. Marinate the chicken strips in the tomatillo finishing sauce for at least an hour. Saute the onion and red pepper. Add the grilled chicken and cooked pasta to the sauteed onion and pepper. Cover the mixture with the Ranchero sauce and add 1/4 cup of water. This looks really good & easy to make! Thanks for a great dinner idea! Yum! And such a simple recipe! 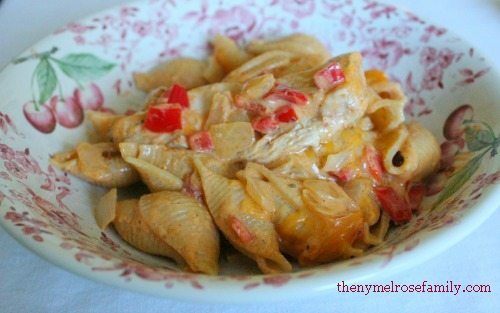 I keep most of the ingredients on hand anyways so this is a great weeknight recipe! Thanks for sharing! Yum, this looks tasty! I almost bought the Verde Chicken Enchilada flavor but went with the Hickory Bbq instead (which tastes great!). I’ll have to try the verde flavor next time for sure.